a bluish-black or gray macular lesion of the oral mucous membrane caused by accidental implantation of silver amalgam into the tissue during tooth restoration or extraction. 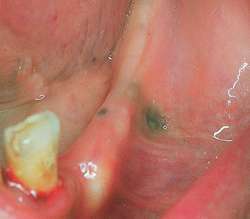 a discoloration of the gingiva or buccal membrane caused by particles of silver amalgam that migrate from an amalgam filling and become embedded under the tissue surface. The condition causes no symptoms and is left untreated. A bluish-black or gray macular lesion of the oral mucous membrane caused by accidental implantation of particles of silver amalgam into the tissue during tooth restoration or extraction. The condition is asymptomatic. Dark macular lesion of oral mucous membrane caused by accidental implantation of silver amalgam into the tissue during tooth restoration or extraction.